Here are the rest of my pictures from the quilt show last week. There are quite a few, and it was hard not to put them all in, but I know you have more places to visit and quilts to quilt! So grab a cup of coffee and enjoy! This first one and the close-ups below it is one of my favorite quilts! Not only is it very clever, but the quilting is fantastic! Marge was really studying this one! This red and yellow quilt was so brilliant in person that it was actually hard to look at! There was a wonderful 2009 Hoffman Challenge exhibition. The two photos below are part of the exhibition. I looked for Kay's entry but didn't see it! Below is the Krazy Horse Quilter's raffle quilt for their upcoming show in May in Pendleton. I'll be there for sure! Don't you just love this Baltimore Album quilt? I know I do! How fun is this! The description said it was a man's quilt! I don't know about you, but it would work for me, too!! The birds are fantastic! Here is Carol below...her outfit matched this quilt, so we thought it only fitting for her to do her Vanna White impression in front of it! What a great Selvedge quilt! The redwork quilt below was stunning! So much work went into the making - and each square is quilted differently! Click on the photo to get a better look! Thanks for stopping by. Next post will be the reveal of a new purchase! Having missed Quilter's Anonymous show this year, I was so happy to hop in the car on Friday, pick up my friend Carol, stop at Starbuck's, and drive to the Tri City Quilters Guild annual quilt show! I love seeing all the quilts, gathering ideas, seeing new and old techniques, and must admit that (don't we all!) I really enjoy the vendors mall! I took a lot of pictures, so I'll split the show into two or three posts. Enjoy! This first quilt is all wool....so scrumptious! There was a display to benefit Breast Cancer Awareness....here are just a couple....click on the pictures to enlarge - they are a hoot! 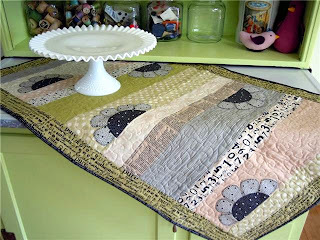 Someone is really into machine embroidery - isn't this an adorable baby quilt? I loved these baskets - and the quilting - oh, my!! This one below is 6 separate pieces. Check out the circles below....if you click on the picture, you can see it's just thread creating the circles - from a distance you would think they are sewn! Minick and Simpson's pattern "Brrrrr Park" Below - wonderful quilting again! Of course I love the pumpkins! McKenna Ryan's patterns were featured - this one actually has little pieces hanging on the line! Look at the quilting below - wow! This gal was kind enough to pose with her great t-shirt! It says it all, doesn't it!! The quilt below is made up of faces from the guild - such artistry went into it!! More baskets....I seem to be drawn to them...does that mean I need to make a basket quilt? I'll give you a day or two to savor these and be back with more! Mr. Squash and I have just completed our very first construction project! You might call it Squash House Two! Our day began with smiles and energy.... ...here I am in below in the backyard with all the parts laid out in order, sorting the different screws and gadgets into their own bins for easy identification. I poured through the instruction manual a few days before this. There were so many languages on each page that I had to take a yellow highlighter and highlight the English sections! Fortunately most of the pictures were fairly clear! I'm sure many of you have encountered pictures that appear to be in a "language" other than your own! Here we are at the first stage - the floor! We leveled the ground as best we could. The fence you see is going to be replaced sometime this summer - a project we are happy to have someone else do! Three sides are up! At this point Mr. Squash is beginning to think he may have to move in there! Here is a not-so-flattering picture of me sliding in one of the roof panels! Just when we were sure Mr. Squash would be taking up residence in the new building, we saw this hot air balloon fly over the neighbors house! It was uplifting in more ways than one! And here is Mr. Squash in front of our finished garden shed! Arent' they both cute? It took us about 8 hours of very hard work - the smiles and energy were mostly depleted at the end, but the next day we were smiling again despite some very sore muscles! We think this is the beginning and end of our joint construction business!! I've mentioned recently that I've been working on some secret projects and now I can reveal a few of them! It's been really nice to take a break now and then from Squash House projects and work on these, and between Miss Sophie and the handwork, my lap is never empty in the evenings! Below is a table runner I made for my friend, Stephanie. Since I forgot to take a picture before sending it off, Stephanie was kind enough to do that for me! I am amazed at how nicely it coordinates with her refurbished kitchen queen in her brand new workspace! In the package I also included a little Easter treat! I found the pattern here while ordering some of Sherri's patterns. If you decide to make it, let me know as there are a couple of "adjustments" that need to be made as I discovered while making it. You can get two bags out of two fat quarters and they go really fast - lots of time to make one or two or more before Easter! I also included an embroidered tea towel, and again forgot to get a photo, but I'm sure you can hop on over to Loft Creations today and see it all. Saturday was my friend, Ulla's birthday! I began making the runner below as part of Stephanie's "No Strings Attached" challenge. As it evolved, I knew who it would be perfect for - Ulla! She and Mr. K. live through very long and harsh winters in Finland, and I knew the bright, cheery colors in this would help lift their spirits as the days get longer and warmer! I also tried a new way of quilting - little freehad swirls! For never having done this and not having a defined plan when I started, I must say it turned out really well! I also included this embroidered tea towel in Ulla's package! It's from a Crabapple Hill pattern by Meg Hawkey. One year at the Sew Expo I purchased quite a few tea towels and lots of trim knowing that when we retired they would make great hand-embroidery projects! And I love nothing more than working on this sort of thing in the evenings, while watching tv with Mr. Squash! Would you believe I'm working on more secret projects? They are a lot of fun and I enjoy sharing with my wonderful blog friends all over the world! Mr. Squash and I have also just completed a major project. Stay tuned as I will reveal it in a day or two! Where Would You "Rather Be"! A Hike and Quilt Guild!